A batch of scrapbooks documenting Durham’s United Fund Campaign are now online at DigitalNC courtesy of our partner Durham County Library. These scrapbooks hold newspaper clippings and advertisements for the United Fund for the years 1953 and 1955 to 1960. 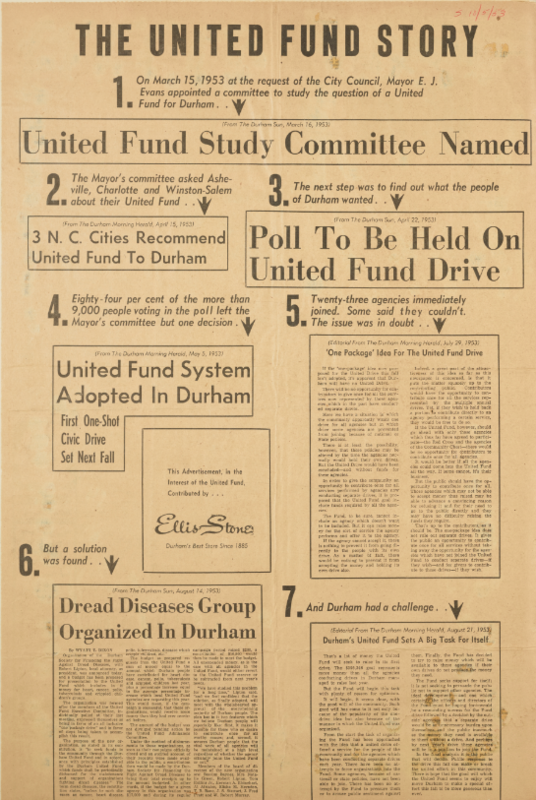 Efforts to develop a United Fund for Durham officially began in 1953, so these scrapbooks document the early days of the fund and its subsequent growth. The United Fund Story from the 1953 United Fund Scrapbook. The United Fund joined the campaigning efforts of more than 30 Durham community organizations in an effort to lessen the fundraising burden of each and increase the funds raised for all. The scrapbooks detail the ways in which many local businesses and citizens donated to the United Fund. Monies collected went to support organizations like the Girl Scouts, the Red Cross, and to fight diseases such as polio, cancer, tuberculosis, and heart disease. 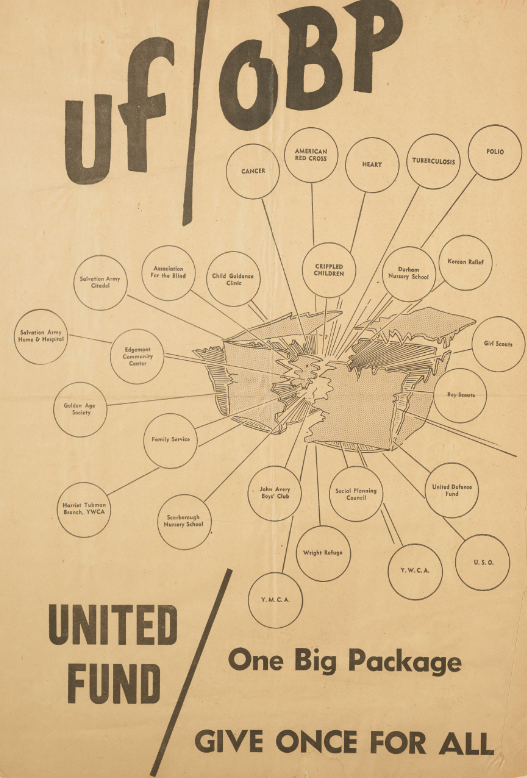 An advertisement from a local newspaper encouraged citizens to “Give Once For All” for Durham’s United Fund and detailed many of the organizations included. Some of the clippings promise that displaying evidence of earlier contribution “provides the basis for immunity from further solicitation” by any of the organizations included in the United Fund. This clipping promises “immunity from further solicitation” once donations were made to The United Fund. 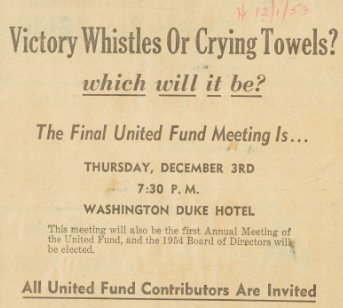 Others communicate the fund’s urgency in some interesting ways … like by asking if participants will need “victory whistles or crying towels” at the next meeting. United Fund contributors were invited to the first annual meeting. These scrapbooks detail times of considerable change in Durham, and join an already substantial collection from Durham County Library. To access more from Durham County Library, visit their partner page or their website.